When someone travels to a foreign country, the issue of funerals can be tricky. Saying or doing the wrong thing can be deeply offensive and hurtful, even if it may not be considered such in your own culture. 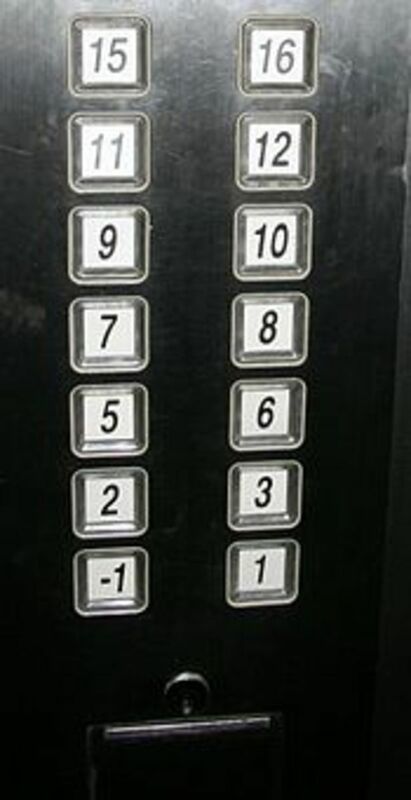 With gift-giving in Japanese culture, certain things can also have a death-related meaning best avoided, for example, giving themes in fours is taboo since the number '4' in Japanese can sometimes be pronounced the same as the word 'death', 'shi'. Japanese culture might be seen by some as death-centered. As I've covered previously in my Hubs on Bushido, the ethical code of the samurai, in Bushido one is instructed to contemplate death in order to obtain moral perfection. A samurai was expected to be prepared to die for his comrades and feudal lord at any time. In Buddhism, the death of the body was not the death of the spirit, which could travel to many worlds after death based on whether it had been good or evil in this life. Since the native animistic religion of Shinto does not deal with the afterlife but Buddhism does. 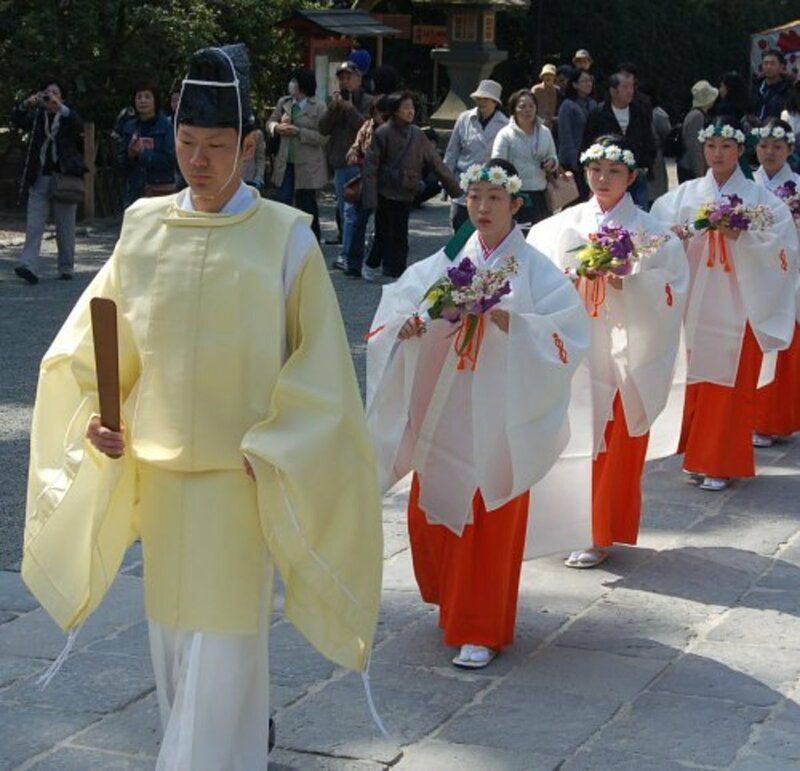 There is a Japanese saying, "Born Shinto, Married Christian, Died Buddhist", meaning that they prefer the Christian wedding ceremony, but the Buddhist funeral rites. The primary method of burial is cremation. Most Japanese funerals are Buddhist. The body is washed in the hospital and usually dressed in a suit or, less commonly, a formal kimono if a man and a kimono if a woman. 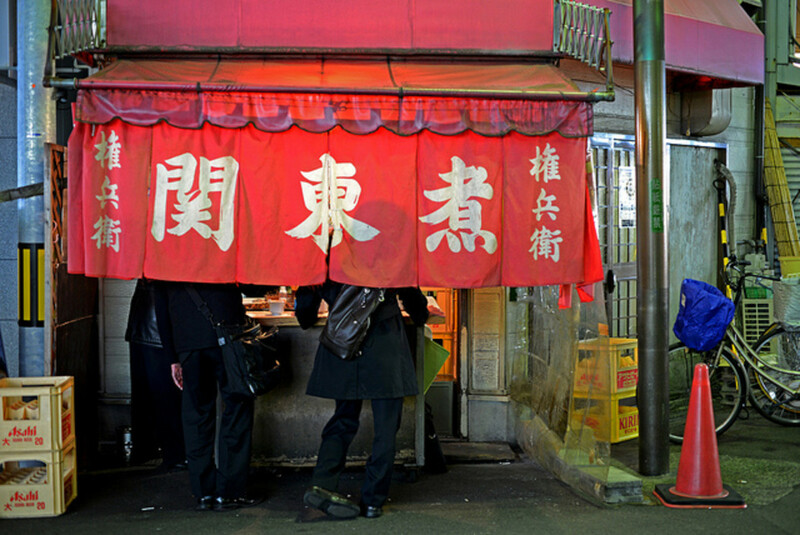 People gather at the home, where the body is taken, and relatives pay their respects, often giving condolence money (usually the Japanese prefer to give all money in an envelope) to the family. There is a wake service, where a Buddhist priest gives a reading from a sutra (Buddhist text), while the family takes turns bowing and offering incense at the altar. The immediate family of the deceased stay up with the body overnight, sitting in the same room. The next day, there is usually a funeral, where the body is taken from the home where the wake was performed (usually a relative's, they don't have special funeral homes like you see in the U.S.) to the Buddhist temple where the funeral is performed. According to a web article from TanuTech (link below), "Almost all of the visitors have rosaries, which they drape over their hands. 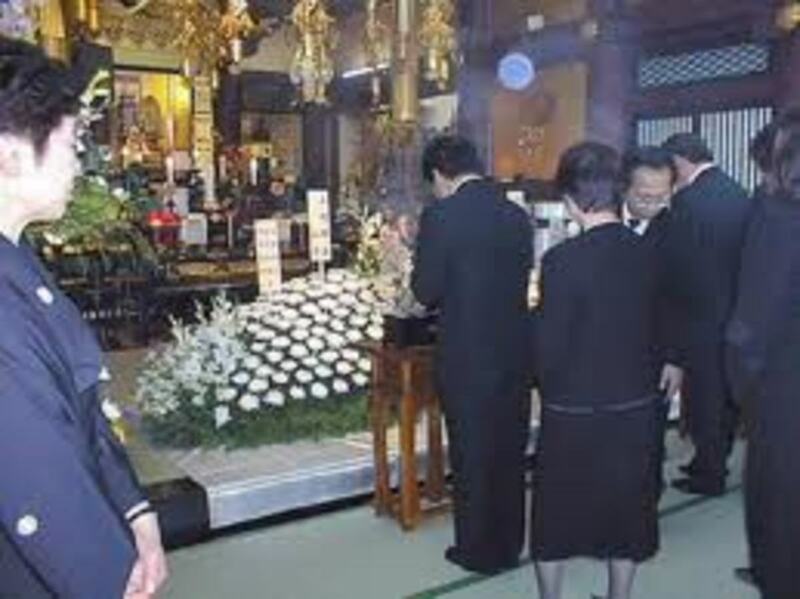 The person offering incense goes to the urn placed in front of the altar, stands at attention (or sits Japanese style on the cushion in front of it if the urn is on a low table on the floor), puts his or her hands together with the rosary around them, then bows. Next he or she places a pinch of incense on the smoldering incense in the urn after bringing it close to the forehead. Some people repeat this process 3 times; others do it only once. The person stands at attention again (or bows while sitting Japanese style if the urn is on a low table on the floor), and again bows before returning to his or her seat." This takes place in the middle of the priest's reading of a sutra. The next step is the cremation. The family use chopsticks to pick the bones out of the ashes and put them into the urn first, with two people holding the bones with chopsticks together. When the urn is full, it is covered with a white cloth and carried usually to a family grave site. One important aspect of this is that the deceased person is given a posthumous name, which is said to prevent the dead person from coming back whenever the name they had during life is spoken. Usually this name is written on a wooden grave marker. As the TenuTech article says "The urn may be taken home and kept there until after the 49th day memorial service, depending on the custom prevalent in the area and the religion. In other areas the urn may be taken directly to the cemetery, and in rural areas there may even be a funeral procession to the cemetery with relatives and friends carrying the urn, the long wooden post or wooden strip bearing the posthumous name of the deceased, a picture of the deceased, ornaments used at the funeral, etc. There are large differences in ornaments, floral arrangements and the processions themselves that are dependent on local customs." Afterwards, custom dictates certain days are reserved for the honoring of the dead, including one annual festival. Shinto means "the way of the gods" and is a religion that sees the Earth as populated by myriads of spirits, or kami. Shinto is a simple religion primarily dealing with communication with these elusive, mysterious kami and rituals symbolizing purity and the life force of nature. Nearly all burial rituals in Japan performed prior to the 19th century were Buddhist, because as I've said before, Shinto lacks complicated beliefs about what happens to a person's spirit after death. In the 19th century, Shinto revivalists sought to make up for this lack and created a Shinto funerary system (Source: Synonym, link below). In these rituals, the burial and mourning process involves 20 steps, each named. Some of the ashes of the cremated deceased person are buried, while some of them are given to family members and placed in their home shrines. In Japanese culture, while the Japanese people will likely recognize that it's just because you're a foreigner and be polite about it, giving a gift associated with death or funeral customs can cause hurt or offense. Gift-giving is common in Japanese business and social settings, but the following things should be avoided. Chopsticks are only stuck upright in the rice offering on the altar at a funeral, so remember to never stick your chopsticks upright in your rice, or other food, in Japan. It's considered bad similarly to pass food chopstick to chopstick or to have two people grasping the same object with their chopsticks at once, because at the cremation, people use chopsticks to put the bones into the urn, with two people holding the same bone in their chopsticks at once. Writing a person's name in red is bad, because grave markers bearing posthumous names are often red. Sleeping with one's right hand facing North is considered unlucky, as this is how bodies are laid out during the wake. Japanese society is entrenched in cultural roots and traditions that give a great amount of honor and appreciation to the dead. That's not to say they have a morbid or death-obsessed culture, as they have numerous festivals that celebrate many other aspects of life. But, they do honorably include death as an important aspect of life, as well. 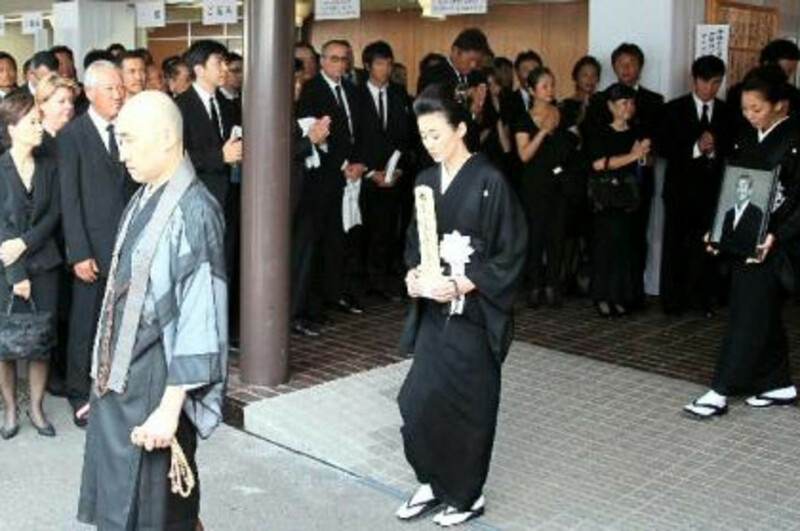 Although not all Japanese people are observant Buddhists, Buddhism seems to have a near-monopoly on conducting Japanese funeral and cremation rites, as well as memorial days after burials to show continued respect for the dead.However, some Japanese people elect for a Christian or Shinto burial instead, as a matter of personal conviction. Foreigners should take care to avoid offense by understanding some of their more prevalent superstitions, especially those surrounding death, because they are the ones more likely to inspire intense fear around the wrong people. But, as in any culture, humility and respect go a long way. "Japanese Buddhist Funeral Customs" by Bill Hammond, 2001.